Sometimes, there are opportunities that are available which catapult your dreams on fast track to being a physician in USA. I personally know of two friends who ended up pursuing their dream of being a physician in USA by a lesser known route. Fellowships! and too without the hassles of a residency. Now this is not to say that you can get by with out USMLE and ECFMG, because you cant. If you want to get into these fellowships which are very competitive, you still need stellar USMLE Scores and a very impressive resume. Something to consider for folks who want to take a break or pursue post grad education in home country. i did look to see if there are any published opportunities for doing a Ob/Gyn fellowship without a residency in US. unfortunately all accredited fellowships by ACOG need at least a year of training in US or Canada. Some programs mention that they will accept training outside of US as long as ACOG establishes equivalency in training. 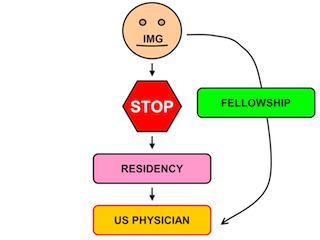 is this getting fellowships by passing residency in USA is valid for DNB/MD anesthesia also? for anesthesia, i have not come across and bypass. there may be some institutions which could offer non accredited fellowships but these positions are not advertised as such. you have to call the programs and find out. Can i get a decent fellowship post MD medicine?? Also i've heard that until you do a residency program in USA you will get to work only in peripheries or small centres.. is it true?? I am not sure I completely understand the first half of you question but I will attempt to answer. If you have done MD medicine outside US then there are not very many ACGME accredited fellowships that you can do. If you do an unaccredited fellowship then the places where you may be employed are extremely limited so in a sense you are right in saying - working in small peripheral centers. I have completed one year of Neuroanesthesia fellowship in US but have not done a residency yet. I do have a valid ECFMG certificate. Is it possible to practice in US without doing a residency? Depends on the conditions of your visa. Most employers, state licensing authorities and primary-secondary payors require an independent practitioner to satisfy minimum requirements. I would recommend checking with the institution, state and licensing boards. I just wanted to ask whether after completing such a fellowship, would one be eligible to write the board exams? (specifically for orthopedics, as ABOS doesn't mention any such thing on their website). Because as far as I have heard, board certification is pretty much necessary to get the patients to trust a doctor. my question is if I have the chance to do any residency program in any state with Puerto Rico medical licence only.? Rad onc or Med onc?